Colombia's president Uribe calls FARC "executioners"
Uribe: "FARC deceive the country, assassinate the indigenous"
BOGOTA, Colombia (CNN) -- Marxist guerrillas in southwest Colombia are believed to have killed a second group of Indians the rebels accused of helping the government, a state governor said. 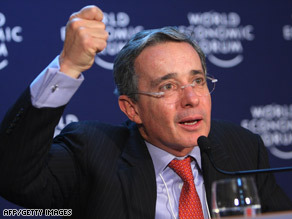 Colombian President Alvaro Uribe vowed the government would protect the Awa Indians from FARC. At least 10 Awa Indians were killed this week in Narino state, Gov. Navarro Wolff said late Wednesday. A day earlier, Wolff had reported that the Revolutionary Armed Forces of Colombia, better known as FARC, had killed at least 17 Awa last week in another remote village. "I don't have more information than what they gave us by cell [phone], but they gave us ... a list of names," Wolff said about the latest killings. He said in an interview on CNN affiliate Caracol TV that villagers told him they cannot be certain that the FARC committed the killings because it was dark. But the governor and others say all indications point to the guerrillas. The killings happened in two villages about a one- to two-day walk apart, he said. Some Awa killed this week were fleeing the FARC because of last week's assassinations, said Luis Evelis Andrade of the National Indigenous Organization of Colombia, known by its Spanish acronym ONIC. The FARC have targeted the Awa because the Indians don't want to get involved in the armed struggle and refuse to reveal information on government troop actions, Andrade said on Caracol. ONIC said the FARC has abducted 120 Awa since February 4 and 44 Awa have been killed this year. "We are very worried about the Awa community," said Monsignor Gustavo Giron Higuita, the bishop of the city of Tumaco. "It is a community that is pretty unprotected and that in the past five years has received a type of persecution by armed groups." The Awa, he said, "are pacifist, want respect of their organization and want to regain their traditions. We have been accompanying them in this process, and that's why this hurts so much." Speaking at a ceremony earlier this week, Colombian President Alvaro Uribe called the FARC "executioners." "Let the world know: The Democratic Security [forces] protect the indigenous because it is for all Colombians," Uribe said. "And the FARC deceive the country, they assassinate the indigenous." Army Gen. Leonardo Barrero is expected to lead troops this weekend into the remote area where the killings occurred. Once the area is secured, a second group will carry out an aid mission, officials said. Colombian Attorney General Alejandro Ordonez Maldonado has ordered the nation's human rights commissioner to launch an investigation and take steps to help the Awa. The Human Rights Watch organization said Wednesday that the guerrillas tortured some of the Awa before killing them with knives. "These cruel killings violate the most basic principles of human decency and dignity," said Jose Miguel Vivanco, the Americas director at Human Rights Watch. "There is no possible excuse or justification for these horrific actions." Wolff earlier had decried last week's reported killings. "The guerrillas took several families, recriminating them for their supposed collaboration with the army," Wolff told El Pais newspaper. "A young man was able to escape and told how he had been tied. Later, they tortured him, they beat him and they killed eight with with a knife." The other nine villagers were similarly executed, unconfirmed reports said. The remote village where the first killings occurred is a 12-hour trip away from the nearest large town, and no independent verification has been obtained. Besides the unforgiving terrain, the presence of land mines and the existence numerous armed groups virtually prevents outsiders from visiting the area. Monsignor Ruben Salazar Gomez, the president of the Episcopal Conference of Colombia, joined the chorus of criticism, calling the alleged massacre a "very grave ... crime the whole country should condemn." New York-based Human Rights Watch said in a release that group members have made numerous visits to Narino, which is one of Colombia's 32 departments, or states. Narino is in southwest Colombia, on the Pacific Ocean and the border with Ecuador. The area has a heavy presence of various armed groups and Colombian military forces and has among the worst human rights conditions in Colombia, the human rights group says. The Awa territories have been particularly affected. The Colombian government has issued a "risk report," warning authorities that civilians in the region are in danger. The FARC is said to have "confined" some villages, cutting them off from the outside world and not allowing anyone to enter or leave. The FARC, the largest and oldest guerrilla group in Colombia, has been waging war against the government since the 1960s. The guerrilla group operates mostly in Colombia but has carried out extortion, kidnappings, bombings and other activities in Venezuela, Panama and Ecuador.